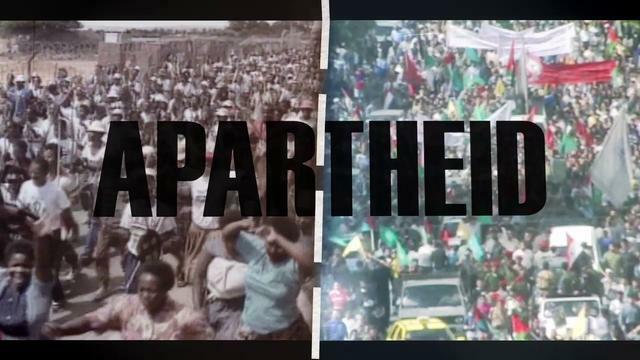 As part of the South African leg of the 2012 Israeli Apartheid Week, the film “Roadmap to Apartheid” is currently being screened in different parts of the country. The film explores, in detail, the apartheid comparison as it is used in the enduring Israel-Palestine conflict. As much a historical document of the rise and fall of apartheid in South Africa, the film shows why many Palestinians feel they are living in an apartheid system today – under Israeli occupation, and why an increasing number of people around the world agree with them. It features interviews with South Africans, Israelis and Palestinians, and the film winds its way through the West Bank, Gaza Strip, and inside Israel moving from town to town and issue to issue to show why the apartheid analogy is being used with increasing potency. It analyses the similar historical narratives of the Jewish people and the Afrikaaners, the tight relationship the two governments shared during the apartheid years, and everything in between. It’s a must-see for all who feel strongly about justice in the world, and especially South Africans – who know very well the experience of such a cruel and divisive system. Click here for details of screenings in Soweto, Modimolle/Nylstroom, Ermelo, and Polokwane; and here for details of further events around the country for this cause, including a panel discussion with cartoonist Zapiro, Professor Allan Boesak, Ronnie Kasrils on Thursday evening. With all the war talk about an Israeli attack on Iran, let’s not forget about the silent war that happens each and every day in the occupied territories. Look beyond the political rhetoric, and think about the people that are suffering as a result of this absurd, inhumane occupation – and imagine what it would be like if you or your family were the victims. It’s through ventures like this 2012 campaign that the reality of the situation can be exposed, and more and more people are awoken to the shocking truth of just what is going on. Many of us take this month for granted – the fact that we can fast (as we’ve been commanded to do), perform taraweeh, and do all the other, communal things that come packaged with this ‘month of the ummah’. But while we have it easy – while we have this freedom – our brothers and sisters in some places are being subjected to tremendous oppression – in that they are actively discouraged, or even banned, from fulfilling these great Ramadan activities. For example, take the Muslim majority country of Tajikstan – whose secular government has banned Muslim youth from the masajid. This legacy of the country’s former Soviet rulers – who banned and punished the practicing of religion – also includes the government imposing sermons on imams to deliver at mosques – publishing a collection of 52 sermons that must be preached during the weekly Friday prayers. Additionally, a government campaign includs the arrest of men with beards, and ordering them to shave. All this in the name of countering “religious extremism”. For more info on the Tajikstan situation, see this article. Another example is the plight of the Uighur Muslims in the Chinese region of Xinjiang. Chinese Muslims already face severe restrictions, but Muslim members of the government throughout Xinjiang must sign “letters of responsibility” promising to avoid fasting, taraweeh, and other religious activities. The Communist government says “Party members are not allowed to fast for Ramadan, and neither are civil servants.” Other individuals are allowed – as it’s a “traditional ethnic custom” – according to the government – but they aren’t allowed to hold any religious activities during Ramadan. With regard to Muslims working for private companies, while there isn’t an outright ban, there are still consequences. Uighur Muslim employees are offered lunches during fasting hours; and anyone who refuses to eat could lose their annual bonus, or even their job – according to one account. And schoolkids and the youth are also not free. Officials target Muslim schoolchildren, providing them with free lunches during the fasting period. Another report, from an Uighur resident ofBeijing, said that students under 18 are forbidden from fasting during Ramadan. For more info on the Uighur situation, see this article. These are just two examples of political oppression – but there may be others. And in addition, there are Muslims in other places that are being deprived of a ‘normal’ (in our sense) Ramadan by other issues – poverty, famine, war, and more. So while we enjoy our Ramadan and attempt to draw closer to Allah through fasting, taraweeh, and everything good that the month brings, let’s stop to feel the pain, try to help, and at least make dua for our suffering brothers and sisters in other parts of the world. And let’s appreciate the religious freedom we have, while we have it. Because if we don’t, we may lose it, and then we’ll look back to these times of freedom with fondness and longing – but without the ability to practice and enjoy our religion the way we are able to right now. 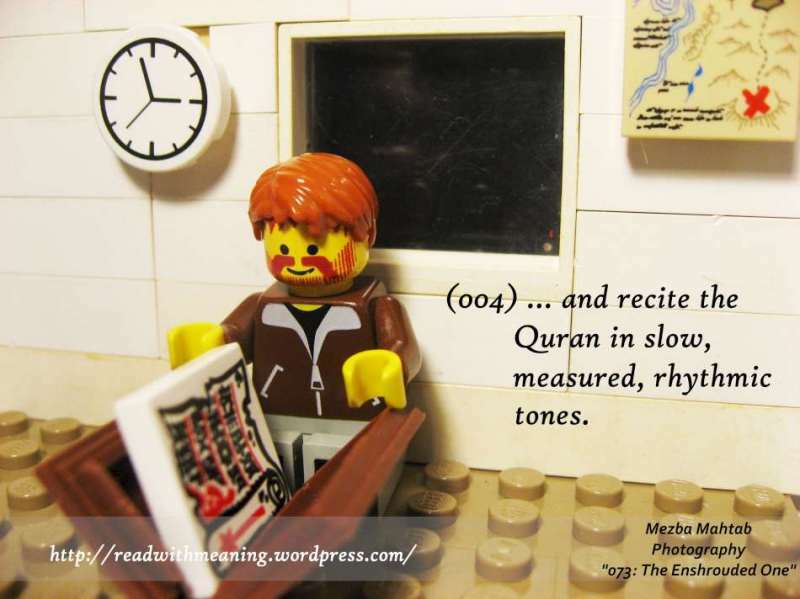 In case you didn’t know, Mezba has set up an awesome website that aims to teach kids (and adults :)) the Quran through the creative use of Lego. You can find the site at http://readwithmeaning.wordpress.com/. On the registration page, choose the year 1432. Registration opened Friday, 29th October 2010 – and the sooner you put your name down, the better. As a reminder to watch what we say, I thought I’d put up a collection of Islamic quotes and more with regard to backbiting. It has been covered before, but we can never get too many reminders when it comes to matters of such importance. I hope these serve as reminders to us all about how careful we need to be with our tongues. O you who believe! Avoid much suspicion; indeed, some suspicions are sins. And spy not on each other nor backbite one another. Would one of you like to eat the flesh of his dead brother? 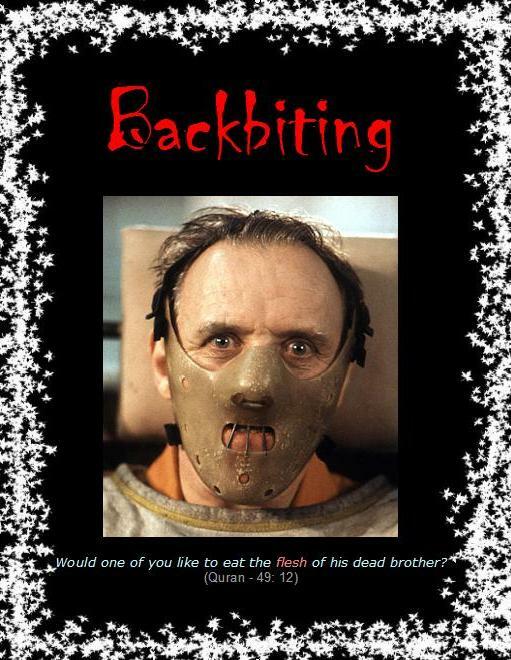 You would hate it (so hate backbiting). 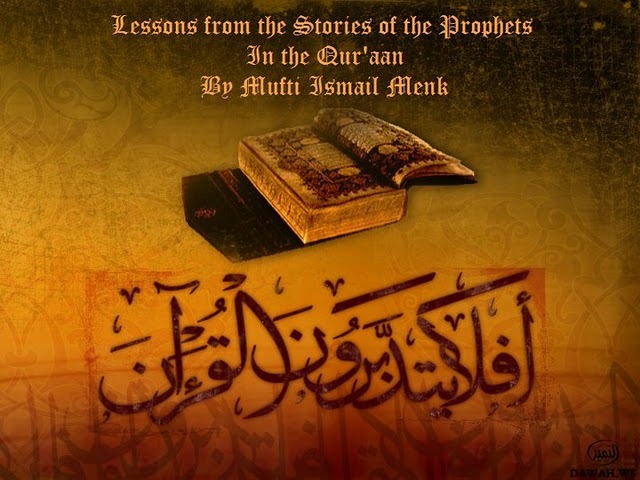 And fear God, verily, God is the one who accepts repentance, Most Merciful. And, for a lighter look at the issue, watch Baba Ali’s video: “Little backbiter”.